Mary writes to her father, grateful for his letter to her advising that she remain at the school despite a cholera threat. She describes the precautions the city is taking and notes that many other girls have left the school, and suggests plans for her parents to take her home. She describes bible class, the examination schedule, Mrs. Willard's view of the Trinity, and asks her parents to give permission for her to leave school for weekly meetings. 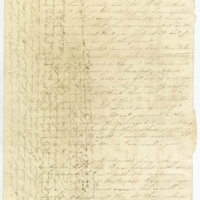 Mary Huntington, “Mary Huntington to Father, June 28, 1832,” Global Valley, accessed April 23, 2019, https://www.ats.amherst.edu/globalvalley/items/show/165.